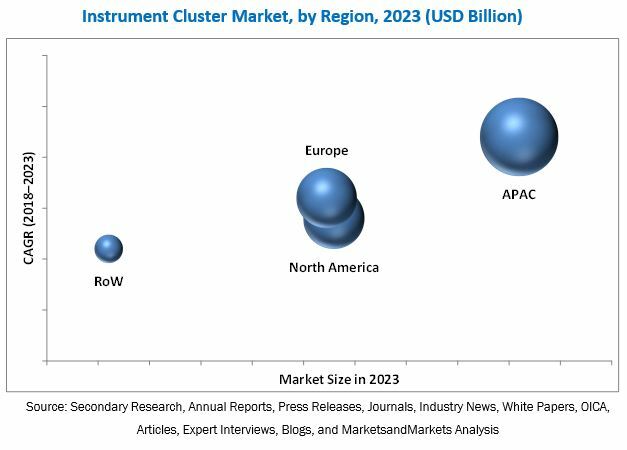 [143 Pages Report] The instrument cluster market was valued at USD 8.67 Billion in 2017 and is expected to reach USD 10.72 Billion by 2023, at a CAGR of 3.5% during the forecast period. The base year considered for the study is 2017, and the forecast period considered is 2018–2023. 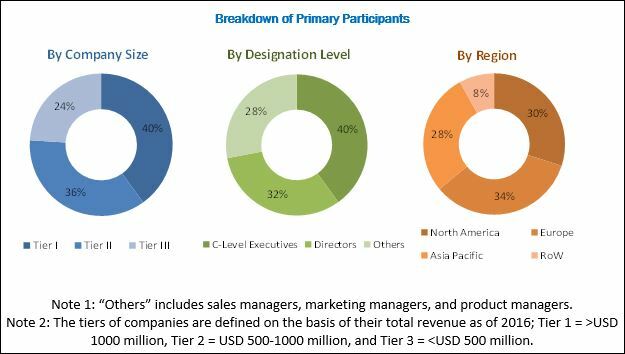 The objective of the report is to provide a detailed analysis of the instrument cluster market based on application, vehicle type, technology, and region. The report forecasts the market size, in terms of value, for various segments in four main regions North America, Europe, APAC, and RoW. It strategically profiles the key players and comprehensively analyzes their rankings and core competencies in the instrument cluster market, along with details of the competitive landscape of the market leaders. The research methodology used to estimate and forecast the instrument cluster market begins with capturing data on key vendor revenues through secondary research. Secondary sources used for this research study include government sources, corporate filings (such as annual reports, investor presentations, and financial statements), company websites, magazines, industry news, associations, and databases (Factiva and Bloomberg). The bottom-up procedure has been employed to arrive at the market estimates by analyzing revenues of major companies generated from different technologies, combining the revenues obtained to get the market estimates, and validating them based on vehicle shipment data. The bottom-up approach also included analyzing the different types of instrument clusters installed in various types of vehicles such as two-wheelers, passenger cars, agriculture vehicles, commercial vehicles, and off-highway vehicles, among others, considering the shipments of vehicles. It was followed by multiplying the average selling price (ASP) of instrument clusters by the number of units to calculate the market size, in terms of value. After arriving at the overall market size, the total market has been split into several segments and subsegments, which have been verified through primary research by conducting extensive interviews with people holding key positions in the industry such as CEOs, VPs, directors, and executives. The data triangulation and market breakdown procedures have been employed to complete the overall market engineering process and arrive at the exact statistics for all segments and subsegments. The breakdown of the profiles of primary respondents has been depicted in the below figure. The instrument cluster market comprises a network of the players involved in research and product development, raw material suppliers, manufacturers, investors, and distributors. Players operating in the instrument cluster market include Continental (Germany), DENSO (Japan), Visteon (US), Nippon Seiki (Japan), Magneti Marelli (Italy), Aptiv (UK), Calsonic Kansei (Japan), Pricol (India), Robert Bosch (Germany), and Yazaki (Japan). It also includes profiles of companies such as Alpine Electronics (Japan), Cypress Semiconductor (US), Dongfeng Electronic Technology (China), JP Minda (India), Luxoft (Switzerland), Mini Meters Manufacturing (India), NVIDIA (US), Panasonic Automotive (Germany), Parker Hannifin (US), and Stoneridge (US). This research report categorizes the instrument cluster market on the basis of application, vehicle type, technology, and region. The instrument cluster market is estimated to be worth USD 9.02 Billion in 2018 and is expected to reach USD 10.72 Billion by 2023, growing at a CAGR of 3.5% between 2018 and 2023. The growth of this market can be attributed to the increasing vehicle production worldwide, stringent government regulations for vehicle and passenger safety across the globe, and increasing demand for instrument clusters from the APAC region due to the increase in sales of two-wheelers. This report segments the instrument cluster market based on application, vehicle type, technology, and region. The instrument cluster market, based on application, has been segmented into speedometer, odometer, tachometer, and others. The market for speedometer and odometer is expected to grow at the highest CAGR between 2018 and 2023. Speedometer is a standard equipment used in various types of vehicles. The major demand for speedometers and odometers is derived from passenger cars, two-wheelers, and commercial vehicles. The sales of passenger cars is increasing globally, which simultaneously increases the demand for speedometers and odometers. The instrument cluster market based on vehicle type has been segmented into passenger car, commercial, two-wheeler, agriculture, and off-highway vehicles. The market for two-wheelers is expected to grow at the highest rate during the forecast period. The price of vehicles and income level of consumers are the key factors that influence the buying decision for two-wheelers. The significant demand for two-wheelers from developing countries such as China and India in the APAC region will provide growth opportunities for the instrument cluster market during the forecast period. The instrument cluster market based on technology has been segmented into analog, hybrid, and digital. The hybrid technology is expected to lead the instrument cluster market. The rising adoption of hybrid instrument clusters for various types of vehicles such as passenger cars, two-wheelers, and commercial vehicles is expected to drive the growth of the hybrid instrument cluster market for during the forecast period. APAC is expected to dominate the instrument cluster market. APAC is the leading region for sales of different types of vehicles, including passenger cars, two-wheelers, agriculture vehicles, and off-highway vehicles. APAC is expected to provide ample of opportunities for the instrument cluster market in the coming years for different types of vehicles. For two-wheelers, the major demand is driven by China and India. China and India are expected to be the major contributors to the growth of the instrument cluster market in APAC between 2018 and 2023. The rise in price of instrument clusters due to advancements in features may restrains the growth of the market in the coming years. Key players in this market include Continental (Germany), DENSO (Japan), Visteon (US), Nippon Seiki (Japan), Magneti Marelli (Italy), Aptiv (UK), Calsonic Kansei (Japan), Pricol (India), Robert Bosch (Germany), and Yazaki (Japan).